Vinaigrette dressings have been used to dress salad for centuries. Originally olive oil was used – favoured because it dampened down the acid tartness by coating the mouth. However, many types of oil are now used to bring unique flavours including walnut, soybean, peanut and grape seed oil, together with more common oils such as rapeseed, sunflower or corn. Similarly, the original soured red wine used for acidity now has many alternatives including rice, balsamic, cider and white wine vinegars. Other ingredients like parsley, garlic, shallot, mustard, orange zest and clove can give a wide range of extra flavours to vinaigrette dressings. 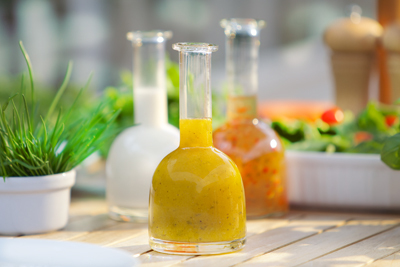 We can help you develop a wide variety of vinaigrette style dressings. Whichever type of oil or vinegar you wish to use our team has the expertise to ensure your product succeeds. Buyers are looking for dressings with particular qualities and we can help you achieve these. Crucially, dressings need to ensure oil and water mix together and do not separate. Alternatively, separation of oil, water and herbs and spices is required to visually demonstrate how much of the quality oil is present, the bottle is then shaken before use. we can advise on the appropriate mix of emulsifier and stabiliser to allow separation. We can advise on how to achieve a homogenous solution for accurate filling/bottling which then separate into individual layers on storage. Our technical team is skilled at finding solutions to all the problems which can arise in the production of new vinaigrette dressings. When developing vinaigrettes, low shear is often required to ‘semi emulsify’ the oil and water together. This tends to give a cloudy liquid with large oil droplets which slowly coalesce and soon rise to the surface. This makes bottling the product extremely difficult since a homogenous product is needed at the filling stage. Sometimes a low level of emulsifier can be used which is not enough to form a strong emulsion. This means a poor emulsion is created which separates after time in the bottle. A low level of stabiliser can also be employed to slow down the separation but not completely prevent it. We can advise you on how to use suitable low levels of emulsifier and stabiliser to allow separation over time. Sometimes the dressing can taste tart in the mouth and needs buffering. However, this raises the pH and can cause concerns over food safety. There are buffers which can combine with water to form acetic acid. It is the acetic acid which penetrates the cell wall of the bacterium and dissociates into acetate and hydrogen ions thus hydrolysing and killing the bacterium from within. We can supply suitable buffers and explanations for their use. With vinaigrette dressings it is more about ensuring a homogenous product is delivered to the bottle with no settling of ingredients at the bottom of the batch tank or oil rising to the surface to avoid wastage and having to add compensatory extras rather than cost reduction. Ease of processing is the key to optimised production. Talk to our food technologists today and swap views with them to determine the smoothest production pathway.